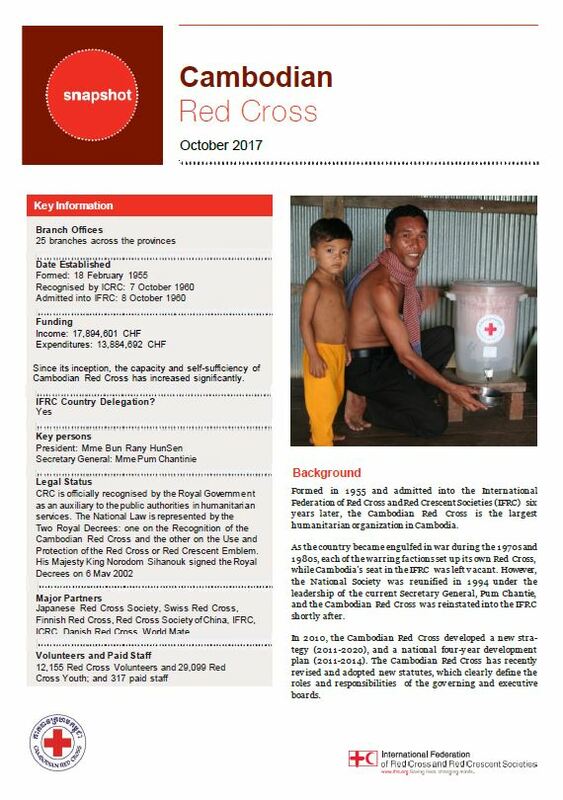 Cambodian Red Cross is the largest humanitarian organization in Cambodia. It was formed in 1955 and admitted into the International Federation of Red Cross and Red Crescent Societies (IFRC) six years later. Funding: Since its inception, the capacity and self-sufficiency of the CRC has increased significantly. While twenty years ago the majority of donations came from international donors, most funding now comes from local donors within the country. Legal Status: CRC is officially recognised by the Royal Government as an auxiliary to the public authorities in humanitarian services. The National Law is represented by the Two Royal Decrees: the Recognition of the Cambodian Red Cross and the Use and Protection of the Red Cross or Red Crescent Emblem signed the Royal Decrees on 6 May 2002. Volunteers: Over 200,000 members (2014), 20,456 Red Cross Volunteers and 29,099 Red Cross Youth.